Bihar elections to begin on 12th October. Bihar elections will have five-phase Assembly elections between October 12 and November 5 and the counting of votes will take place on November 8. Chief Election Commissioner Nasim Zaidi said on Wednesday that polls to the 243-seat Assembly would be held on October 12, 16, 28, November 1 and 5. The term of the current Assembly expires on November 29. We have devoted a lot of preparations to Bihar elections. The Commission has made more than adequate arrangements of central paramilitary forces. The Commission has ensured assessment of all vulnerable points where anti-social elements have been recognised. Out of 243 Assembly constituencies, 47 are affected by left-wing extremism, 29 districts out of 38 are covered under left-wing extremism. The Commission has mounted special vigilance, security strategies to ensure safety of voters. The Commission will ensure that common man is not harassed by field level machinery. The Election Voting Machines will be carry photos of the candidates. In a first, voters will get paper receipts in 36 constituencies. Model Code of Conduct will be enforced with immediate effect. 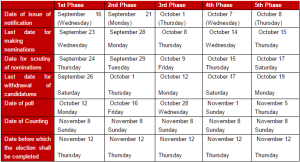 The elections to be conducted in five stages. 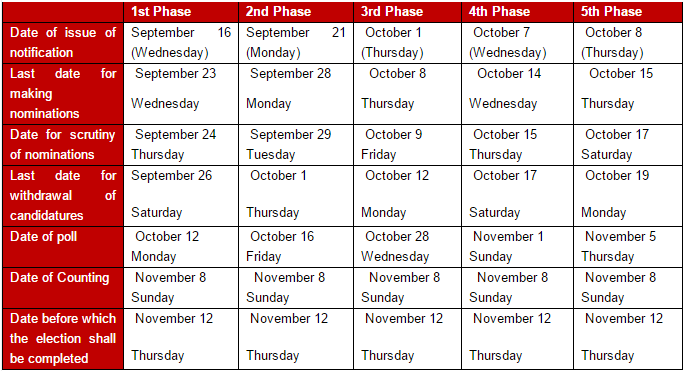 Dates for five-phase polls are: October 12, October 16, October 28, November 1 and November 5. The counting of votes will be held on November 8th. Next15-days deadline to fix call drop issue.